I am sorry not to have updated my blog in so long, but I have been so very busy with training and working. I am lucky to have three days off from work in a row which I can now sit down and spend a full day of writing. 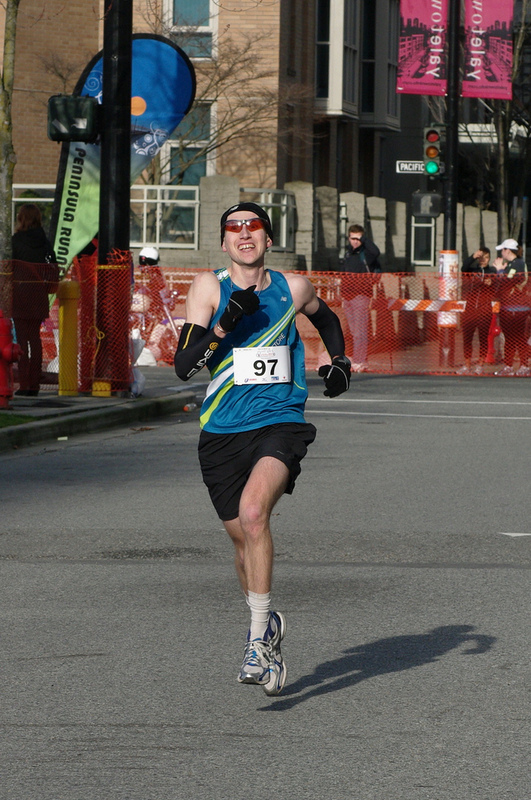 It's been a fantastic start to the 2011 running season! I am so lucky to be in Vancouver and surrounded by so many talented and driven athletes. I will be posting all missing blogs today so I hope you're craving a good read because I know I owe it to all of you. So here we go! First race since the Icebreaker 8k was the inaugural First Half Half Marathon. It was my first time running this course and I must say despite the outcome, I really enjoyed the course. My training up to this point was bang on so I was expecting some good results from this race. There were some big guns out for this year's race including our now home town Canadian superstar Dylan Wykes, David Jackson and Jerry Ziak. I knew with them on board and with fellow team mates Graeme Wilson and Drew Nicholson running in great form that there would certainly be some fast times out there on this flat and fast course. The air was cool and brisk and there was no rain or sun and some pretty windy spots out around the park, but all in all great conditions for racing in mid February. From the first mile I felt very comfortable. I watched Nicholson and Wilson pull ahead with Stan Jang, VFAC's newest speedster. On a side note: I chased Stan down one day on the seawall as he and I were doing our long easy runs. (if you could call it that at his and my pace) I really had to speed up to catch him and knew that he was good when I finally caught him. He was currently not with a team but with his talent I knew I must recruit him. I invited him to come out and at the next practice he was there. Since then he hasn't missed one and has become an integral part of the speed involved in our workouts. Any ways, back to the race. I watched them slowly pull away and wondered how and why all of them could be running so fast after the first mile. I figured they were just caught up in the excitement (except for Wilson as I know he doesn't get excited even when he wins.) and that I would catch up to them when the start line adrenaline wore off. I fell in with a couple of younger runners from UBC and felt strangely relaxed as I looked at my Garmin and it said 3:13/km. My watch was telling me that I was under pace and running a 3:17/km mfor some time after that. Coach Hill had prescribed me a slower start pace which by now I was sure I was on point for. I figured I must be in good shape because I thought I was on pace. I decided to ignore the fact that the group I should have been running with was pulling away as I figured I was running my own race and to not push beyond Coach's orders. This continued until we got to around the 7km mark where team mate Kevin O'Connor was running along side me as we entered Stanley Park. He was not racing but there for support. He told me that I should be pushing ahead now as he knew I was running too slow and was certainly in the wrong group. I said to myself "What the heck are you talking about?, I'm right on pace." at that moment, I had a more thorough look at my Garmin and realized what he was talking about. The whole time I had been watching my average pace rather than my actual pace and because of the speedy start, it made it look like I was running faster than I was. At that moment I realized I had made a huge mistake and that was the reason I felt so damn comfortable up to this point. It really did feel like I was out for a Sunday morning long run. I knew the next few kilometres were going to be very windy and was reluctant to leave the draft of these two runners. At the same time, if I stayed with them I knew the race would certainly be lost. I left them as if they were standing still and plowed through the head wind as if my life depended on it. Half out of desperation and half out of anger as I should have just listened to my body and not my stupid Garmin. The next 5ks were run at a ridiculous 3:15 pace in hopes of making up some ground. I was able to claw back two positions and get some ground on the third man ahead of me. As I neared second beach I could hear footsteps closing in behind me. It was those damned youngsters again!! I thought they were history. 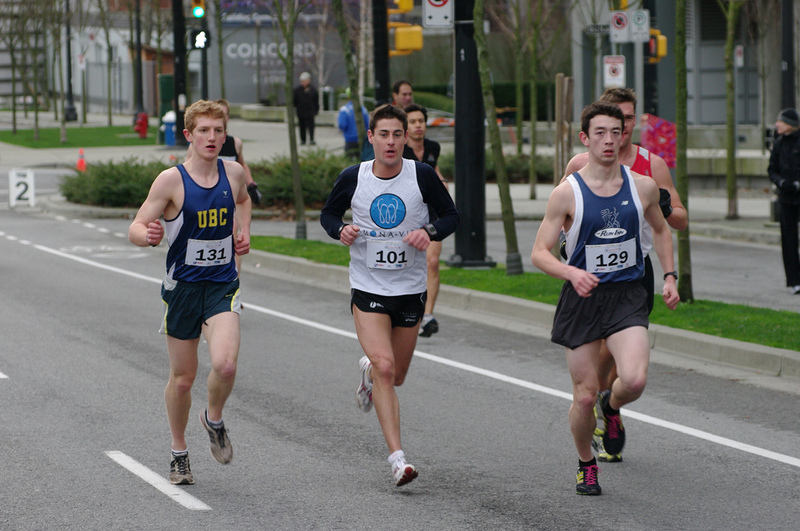 Before I hit the pool, those two young UBC runners had worked together to close the gap and I felt demoralized as they were now very close to catching back up to me. I hate to be chased as it makes me tired, but they were two and I was all by myself. I looked at my watch and realised my efforts were in vain. There was no way I was going to make up the time I needed to break last falls half marathon PB. I decided to sit in and let them give me a draft as we rounded lost lagoon so that I could save some energy to outrun them into the finish. By this time we had caught up to and swallowed up the older runner ahead of us and now had a pack of four running around the lagoon. I was feeling very fresh at this point and felt as thought I could have surged and dropped them. I picked it up a little and could tell the younger runner out of the two UBC guys was fading hard and fast and his technique was falling apart. It wasn't long before we were only two along English Bay beach. UBC V.S. VFAC! There was a small hill out of the beach back to Pacific Avenue which we both dug deep to get up. As we hit the road I dropped the hammer and the UBC runner didn't respond and I knew I had what it took to continue this pace to the finish. Little did I know, in my fuzzy tired runner's brain, I forgot the steep and short last hill within the last km before the finish. Luckily my team mate Enej was at the top yelling so I was able to keep on rolling over the top without slowing down. The finishing crowds were large and loud so it was easy to keep the finish line sprint on. 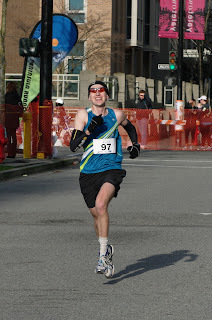 I was pleased that even with my lousy start that I was able to get in under 1:13. Good enough for 8th overall and third in my age group. I was quite displeased with myself on this one and would beat myself up over it for the next few days. Unbeknownst to me the stellar next few weeks of racing I had ahead. One thing I can say about this race is that I was super glad to see Drew Nicholson hold on to Graeme Wilson so tightly. What a stellar performance by him as I know he has had a lot of trouble recovering from injury and sickness. Welcome back Drew, I look forward to chasing you down some more. 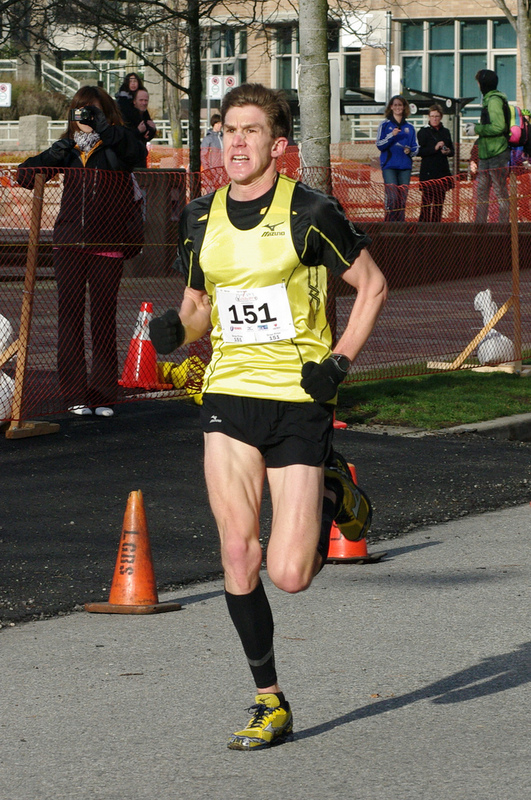 A special congrats go out to Dylan Wykes who slaughtered the course record and I hope will certainly make the Canadian Olympic team this year for London 2012. He's such a nice guy and has worked very hard for a long time. I'd be proud to have him represent this country. He's certainly one of my idols. Things I love: Knowing that my team mates are always there for me. Dylan Wykes setting a new course record for the overall win. Drew Nicholson realizing his accomplishment with 25 meters to go! Nice result, Dave. I'm really sorry I had to miss this race this year (family emergency). Everyone I know had really good times on this course.